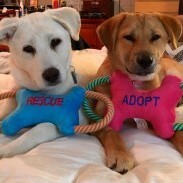 Jay and Gigi (formerly known as Apple and Peach) who were saved from one of the Korean dog meat farms, are doing great!! They are playful and happy babies who have doubled in size in the three months since we adopted them. Gigi is a silly, funny love bug, and Jax is a pseudo tough guy who is afraid of his own shadow (literally lol). They play all day and love other dogs. Oh, and Gigi makes purring noises like a cat! !